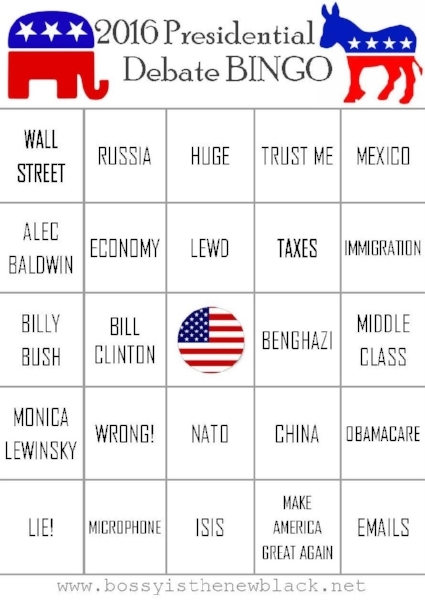 Play 2nd Presidential Debate Bingo! Well friends, it's been a crazy couple of days. We've hit a new low with a certain candidate's behavior and we are almost to the point where who knows if he'll really make it to November 7. For now we have another debate to get through and if recent events are any indicator, it's going to do a doozey. Keep some sanity by trying to have some fun! Drinking every time Trump lies can be a little dangerous (especially on a Sunday night), so how about bingo? Download my free 2nd Presidential Debate Bingo Cards here! Be sure to keep hydrated and buckle your seatbelts.